We have a pear tree. Remember when Adam was lopping big limbs out of the top of it? 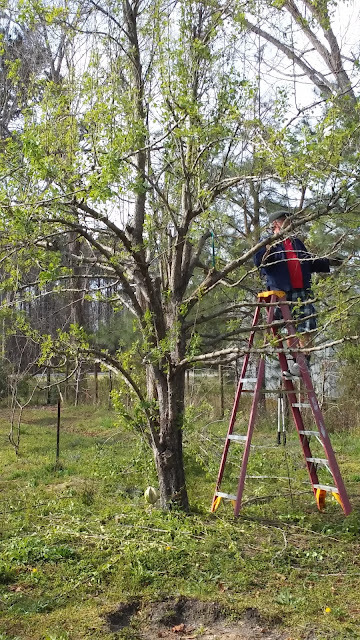 He's lopped off branches twice now, and will do it once more. This summer I picked fruit from it, although most of the pears are too high for me to reach. I decided to make pear butter! 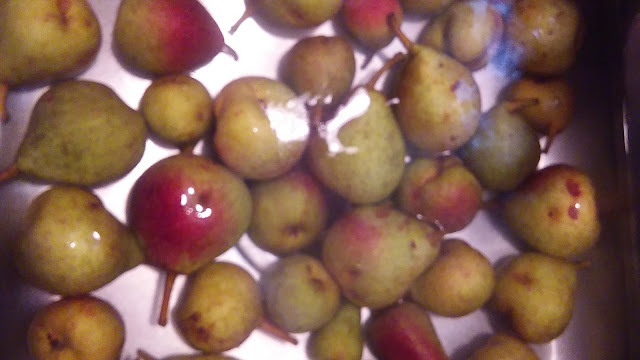 First I put the pears in the frig for 24 hours, as many websites said to do. Then I laid them out on the guest bed on newspaper for a week to ripen some. Then I washed them in water and baking soda. It's not a huge amount of pears, maybe one somewhat full plastic grocery bag. But I didn't want a huge project, and if the pear butter turned out horrible, I didn't want to waste ingredients and jars. Pears are bland, so this is perhaps better called "spice butter." The pears are just a carrier fruit. I also put in two apples that were sitting around, unloved. I cooked and processed it just like apple sauce/butter. Except -- I added more sugar, more spices, and lemon, orange (about 1/2 cup), and lime juice. All recipes said to add citrus for flavor; most instructed to add orange zest, which I may do next time. For spices, I used a cinnamon/clove/nutmeg/allspice blend. It needs more spices than you'd imagine, but you don't want a bland spread. And about a teaspoon of salt; don't forget that! And I mean to say ... ohmygoodness, it's worth it! I'd been taste-testing it as I cooked it (in the crockpot), and was doubtful. It had just a bit of the grainy texture of pears, and the flavor was just a little odd. 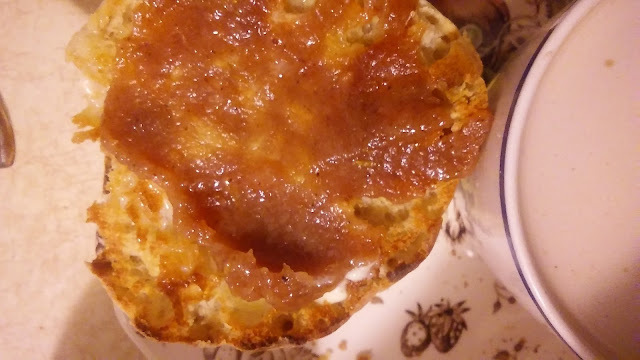 But this morning I put it on an English muffin with butter. Wowzer! It's better than any jam in our frig! 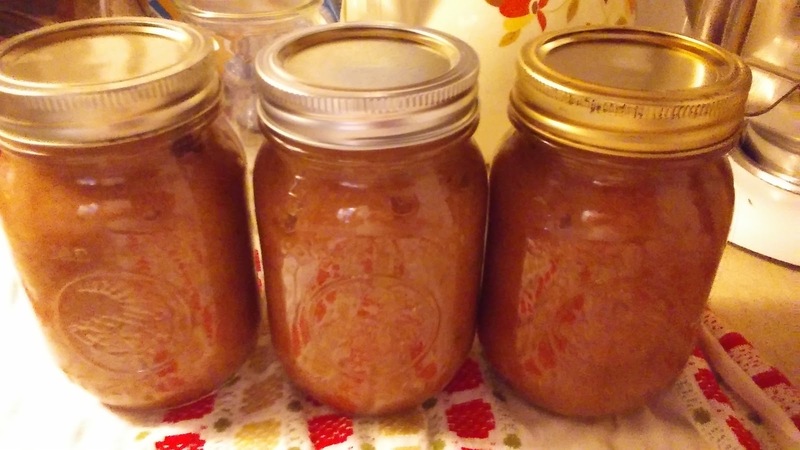 It's better than my homemade apple butter! This stuff is the bomb. So now we're going out with a ladder to get more fruit, and I'll begin the process all over again. I'll have this yumminess all winter long! It sure looks delicious and thanks for the tips. Sounds like your experiment was a success! I may have to buy a lug of pears at the store and try this sometime when I'm feeling homestead-y. My crockpot hasn't been used in ages! Enjoy the fruits of your labor! I love pears, especially when they are turned into cider. I never thought of pear butter....sounds delicious. This sounds and looks delicious. How neat that you'll be enjoying jars of this good stuff during the winter.